Hook: Dry fly hook, sized to suit. 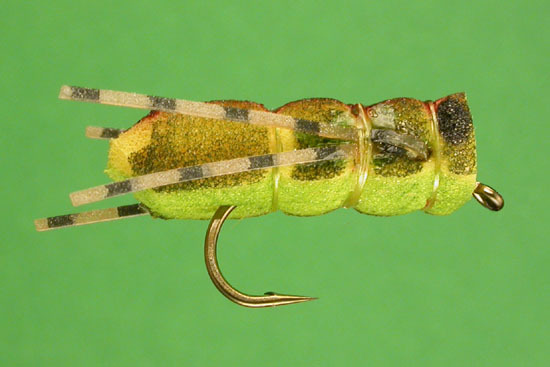 Jay Fullum's "Early Hopper" first saw the light of day in the Summer 2000 issue of Fly Tyer magazine, and was most recently published in his book "Fishy's Favorites". For the body I used a yellow pre-cut hopper body from Bill Skilton (billskilton.com), which eliminates the cutting and trimming that Fishy uses when carving his bodies from blocks of foam. 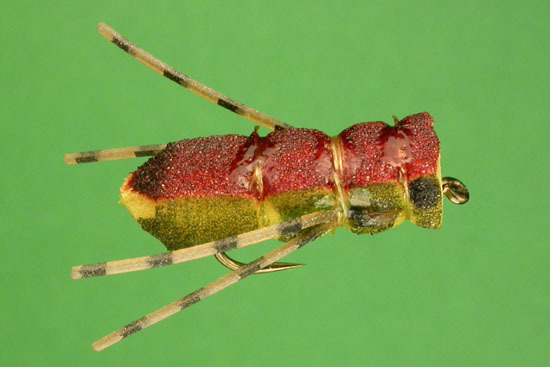 The body is slit along the bottom and super glued to a thread covered hook shank. A couple wraps are made along the body to create the impression of segmentation, followed by a couple swipes with a marking pen. Add legs, eyes, and that's that. These are extremely easy to tie, and they look fantastic. They are my favorite hopper pattern by far.